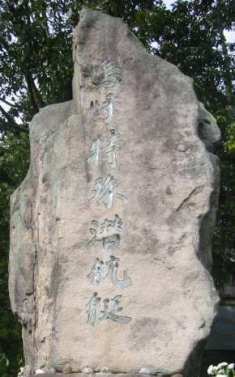 Hachimanyama Jinja in Ondo-chō, which became part of Kure City in 2005, has a monument dedicated to men who died as part of Japanese special submarine operations during WWII. 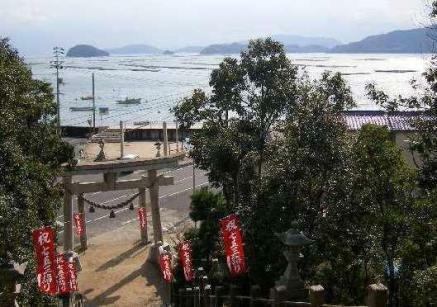 This Shintō shrine overlooks the Inland Sea off Ōurasaki, the wartime location of a special submarine factory and a special submarine base (code name of Base P) where crews trained. The term "special submarine" (tokushu senkōtei in Japanese) refers to midget submarines used by the Japanese Navy starting with the attack on Pearl Harbor. Two-man Kōhyōteki midget submarines were used throughout WWII. The Navy also developed a three-man Kōhyōteki model, a five-man Kōryū, and a two-man Kairyū, but these midget submarines never saw battle action. In December 1941, fighting began in the Pacific. Kōhyōteki special submarines, which made up the first special attack squadron, were a highlight of the early part of the war when they travelled a long distance, infiltrated the Hawaiian harbor, and attacked the U.S. main fleet. Next they invaded Madagascar in the west and Sydney in the south. They shocked the English and Australian fleets and shook greatly the morale of all their men. In addition, they supported the war effort by fighting in one place after another such as Kiska and the Solomons. The pilots risked their lives to use special submarines as special carrying tubes and to supply the front lines. At times squadrons trained here at the base established at Ōurasaki and also faced life-or-death situations. Finally, as chances for victory in the war became slim, the enemy frequently invaded Japan's coastal waters. Our squadrons planned to meet these assaults in various places, and Koryu were expected to have battle successes in Mindanao and Okinawa. Kaiten also went quickly to these places, and together with Kairyū were prepared for the decisive battle for the homeland. In August 1945, hostilities finally ceased. Over 300 men had died in battle or in performance of their duties. Their comrades came together here to honor these brave souls and to extol and hand down to posterity the distinguished services of these special submarines. Near the bottom of the steps up to the monument, there is a map to show the places where special submarines were deployed during WWII. The map indicates the number of war dead related to special submarine operations to be over 440 men, in contrast to the "over 300 men" indicated on the plaque on the back of the monument. There is also a bronze plaque, near the bottom of steps to the monument, that shows different types of special submarines and their specifications.